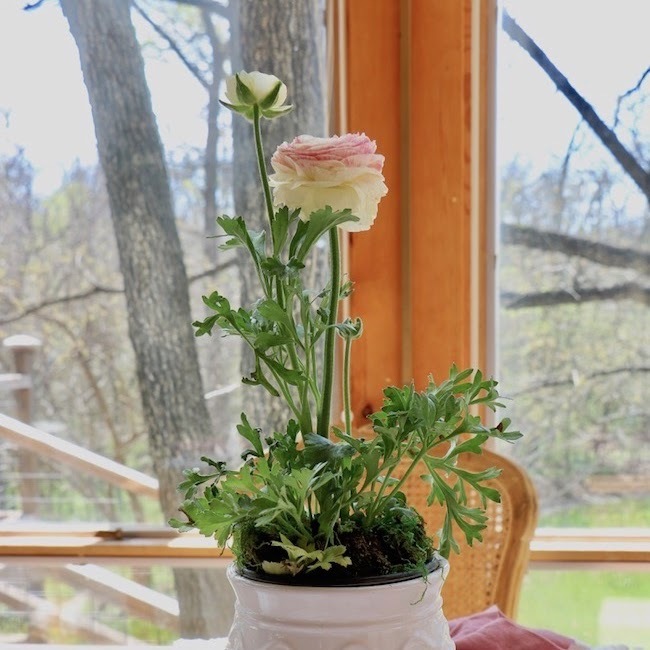 Set the stage by pulling together furniture and flower pots in the three colors that instantly shout PATRIOTIC . . . red, white, & blue. You don't have to use all three colors as your foundation color scheme in your furniture and flower pots, but using two of the colors strengthens the subconscious feeling of an American holiday without obvious patriotic symbols. 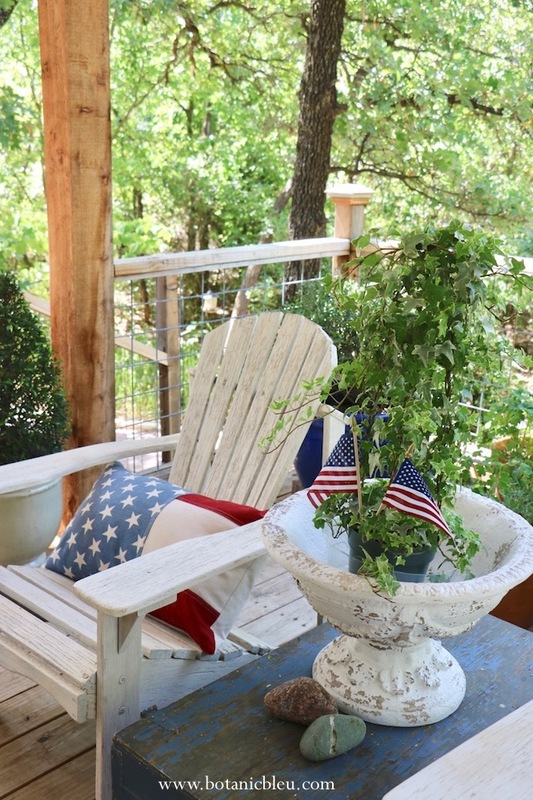 White Adirondack chairs, blue ceramic pots, white ceramic pots, and a rustic, chippy wooden blue box become part of patriotic decor when just a touch of red is added. 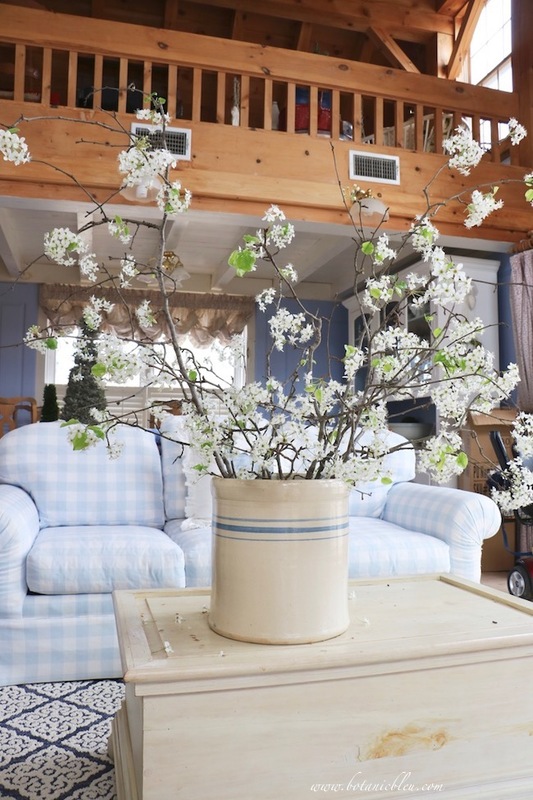 Blue and white looks welcoming year round. Add red and, voilà, you have patriotic porch decor. Take a look at your outdoor furniture. Do you have some chairs or tables that need refreshing? How about painting them white or red or blue? 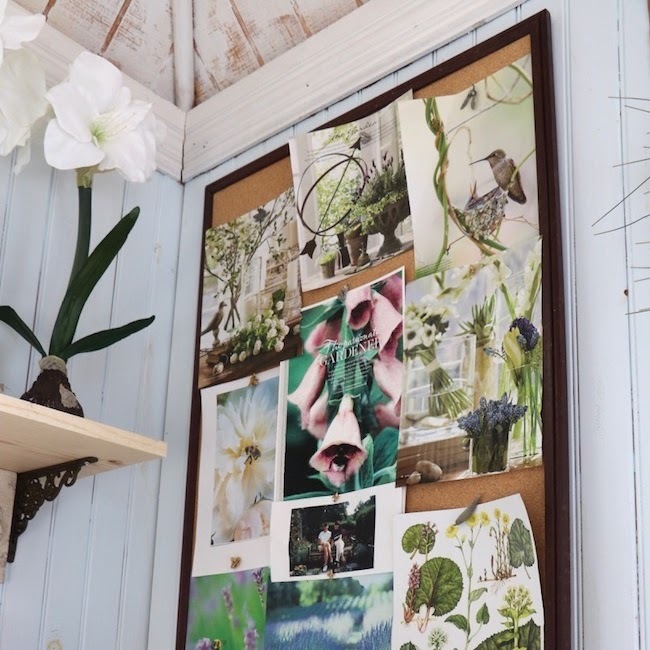 By starting now at the beginning of August, you have plenty of time to paint them before summer is over and before Labor Day. I painted this set of old weathered Adirondack chairs white a few years ago and love how the white looks all year, but especially with patriotic holiday decor. Just one pillow with a red stripe and blue stars design on a white chair changes a summer white chair into a patriotic porch chair. 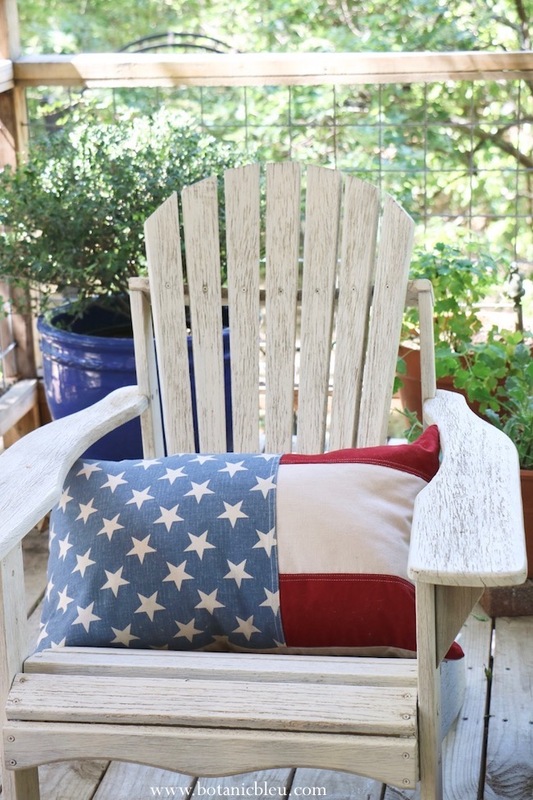 You do not have to buy several flag-look pillows to scatter around the porch. In fact, just one flag-look pillow gives the entire porch a patriotic look. Watch for special holiday pillows on sale the day after patriotic holidays, July 4th, Memorial Day, and Labor Day. Or, look for them at outlet stores at the end of summer. I bought this pillow cover at a Pottery Barn Outlet and saved it to use much later. If you are handy at sewing, you can also make your own patriotic pillow cover. Debbie at Confessions of a Plate Addict has a great tutorial for making your own stars and stripes pillow. Since you are thinking about your patriotic porch a month in advance, you have plenty of time to stitch your own pillow cover. You also may want to browse through Debbie's posts since she has several DIY patriotic projects. 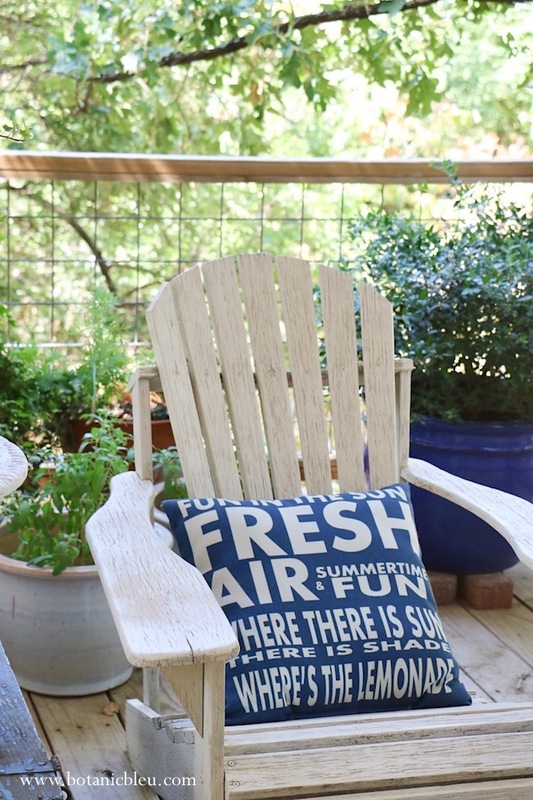 Add complementary fun pillows in blue and white with a summer quote. The fun quote is not patriotic, but the blue color is the same as the blue in the flag pillow. Choose flag blue, not navy, baby blue, or aqua for the background color. Or, use a white background with flag blue letters in a whimsical quote to bring smiles to your porch's visitors. And to bring smiles to your family. Use a patriotic quote to up the patriotic look. 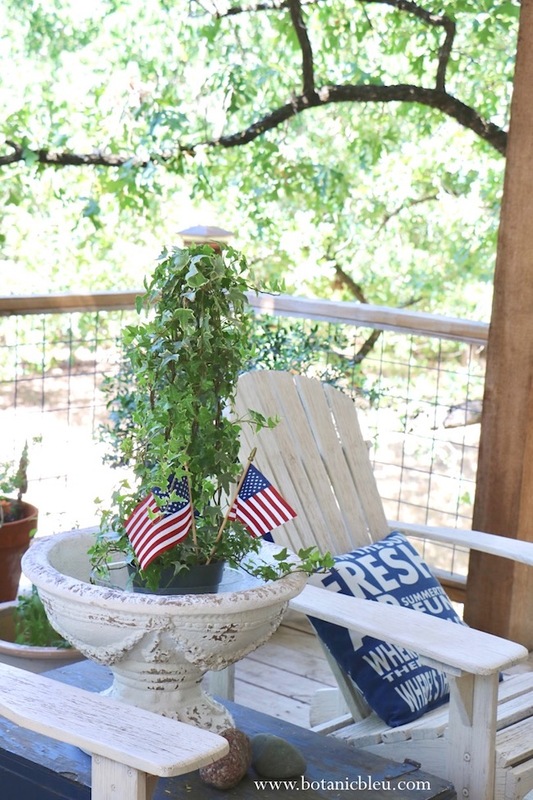 Ann of On Sutton Place created beautiful FREE patriotic printables in her post for last minute patriotic decor ideas. Use one of them to make an iron-on transfer for a pillow. Nothing is simpler nor more patriotic than using flags. 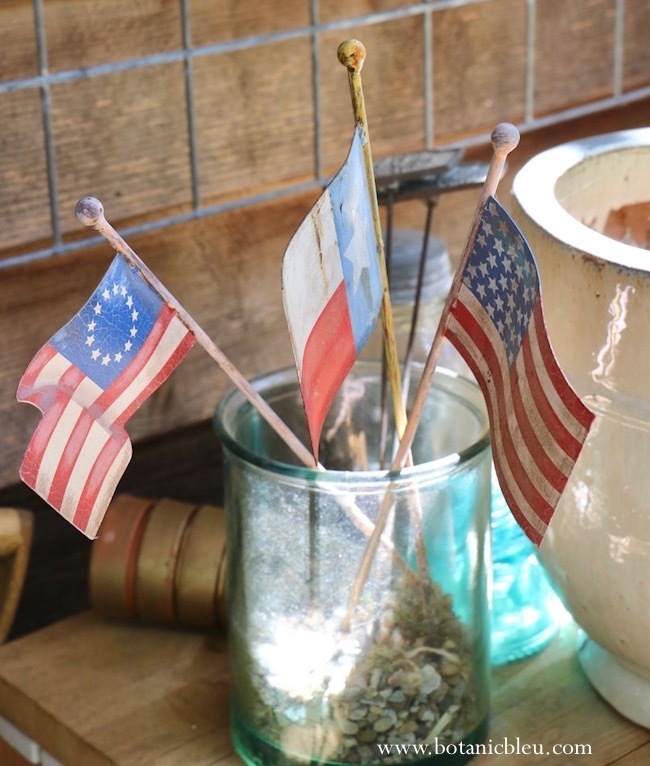 Add small American flags to planters and flowers for the quickest way to give any room instant patriotic decor. You can find inexpensive flags in stores, including grocery stores, leading up to Independence Day, Memorial Day, Flag Day, and Labor Day. Don't overlook using your state flag or a historic USA flag pattern along with the current American flag design. 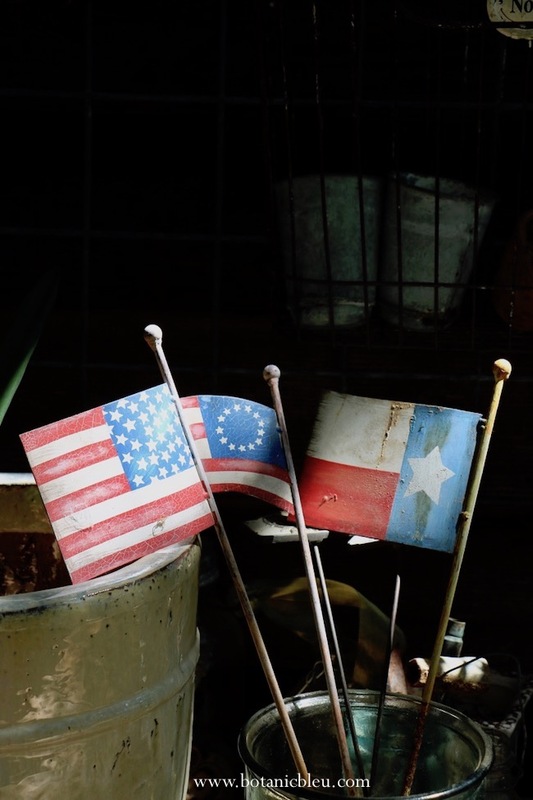 The Texas state flag has the same colors as the USA flag and is a way to show your state pride along with your American pride. THE FRENCH CONNECTION ~ The French tricolore is also bleu, blanc, and rouge (blue, white, and red.) If you are traveling to France, pick up a handful of small French flags to use in your patriotic decor back here at home. French flags are on my wish list of vintage items to buy at French flea markets. Chances are you can already find flags in stores for the upcoming Labor Day weekend. But, if there are not any for sale near you, you can order small flags from the internet. 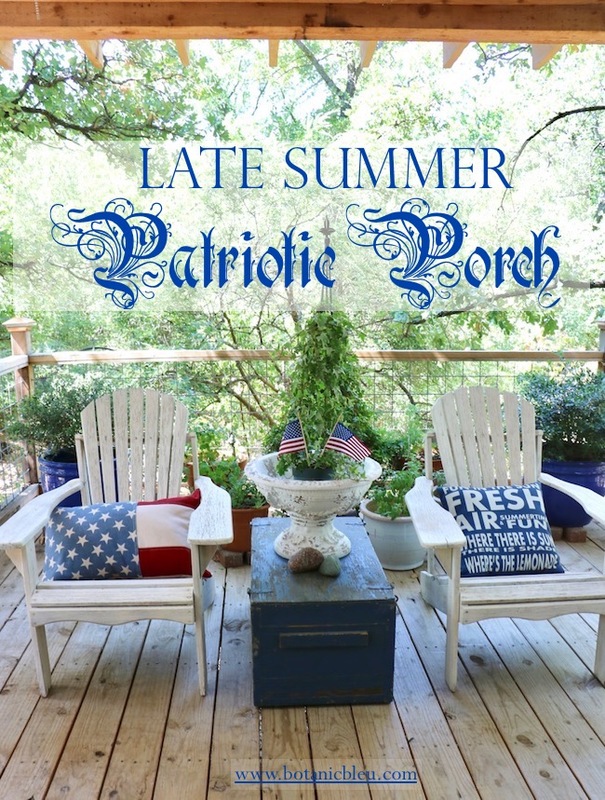 Since you are gathering your patriotic porch ideas now, you have plenty of time for your order to arrive before Labor Day. 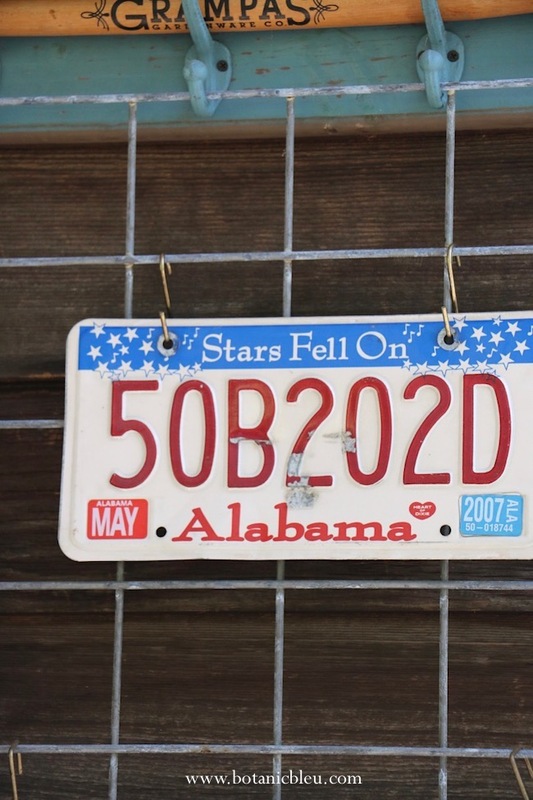 License plates are another quick, inexpensive way to add patriotic decor. They are made to hold up to any weather and take a beating on the fronts and backs of cars. That makes them perfect to use in outdoor spaces in your home come rain, ice, or extreme summer heat. A bit of nostalgia for my home state of Alabama and a connection to one of my favorite uncles make this license plate one of my favorites. When I asked friends and family if they had any old plates I could have, my uncle found this old plate from his car in his garage. Stars ... and red, white, and blue ... perfect patriotic decor. Another great thing about license plates is they come ready to hang with screw holes in place. 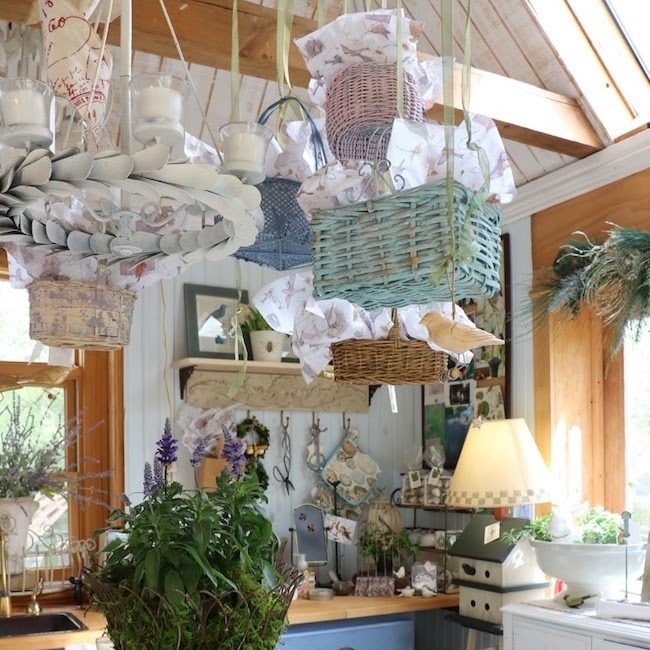 Use a couple of S-hooks to hang on wire grids or ladder rungs for instant hanging and instant removals. Ask your friends and family for any license plates they do not want or search Ebay or Etsy for specific plates with meaning to you. Like, Virginia Is For Lovers. Where I met and married my true love. 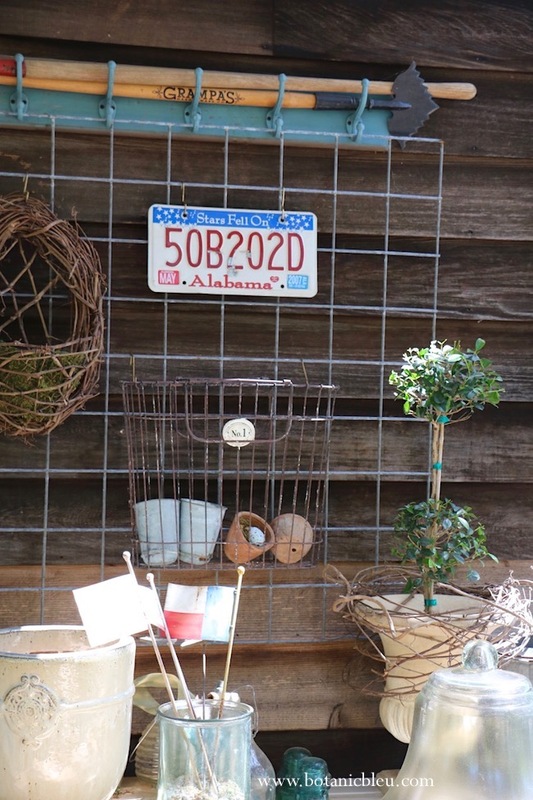 Rustic metal flags and a colorful license plate are all that are needed for a patriotic display on your outdoor potting bench. Don't forget to PIN photos in this post to your own holiday/patriotic board. A quick word about complimentary versus complementary. Do these two words confuse you like they sometimes confuse me? Compl E mentary ~ 1) something completes something else as when two things go well together (ex: patriotic quote pillows go well with flag pillows,) 2) in geometry, two angles that add up to 90°, 3) in art, two colors (ex: purple and yellow) directly across from one another on the color wheel. Thank you for reading. 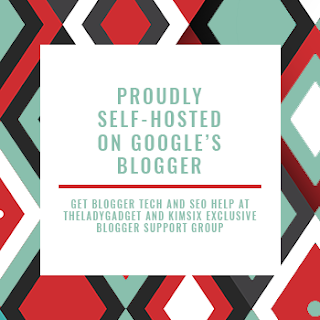 I would love to send you all my blog posts, as soon as they are published, straight to your email inbox. Use the sign up form in my sidebar. 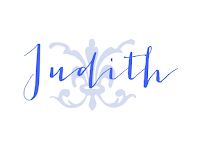 Judith, this is a great post. I'm one who enjoys using patriotic colors and items for the summer months. I actually leave mine out Memorial Day to Labor Day. To keep things fresh across the months, I move things about and change it up. You should share this on IG with the hashtag holidayhappyhome,a weekly challenge to post patriotic decor photos. 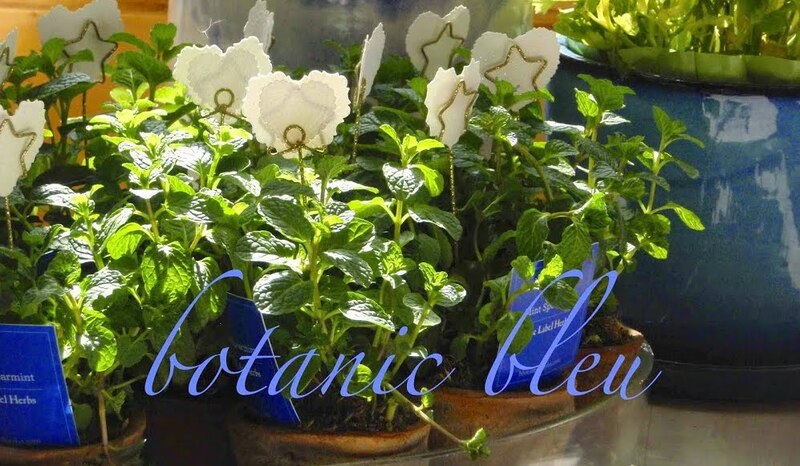 I love using flags in my potted plants! 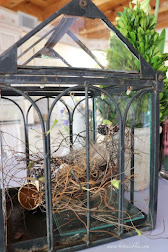 Instant decor! And thank you for teaching me about the 2 words! For the last two years I’ve done a slight patriotic the,e on our deck for the summer. After all we go from Memorial Day, to the Independence Day, to Labor Day! I love red anyway and it’s easy to add some blue, hang a bunting or two and pop a flag into my urn! Your porch looks wonderful. Soo cool and welcoming in the summer heat we've been getting. Fun post! I wish it wasn't so hot here, I'd put many of your ideas to work. I'll save some for the fall! Lovely! I love that license plate. I have a fun one from N.Y. 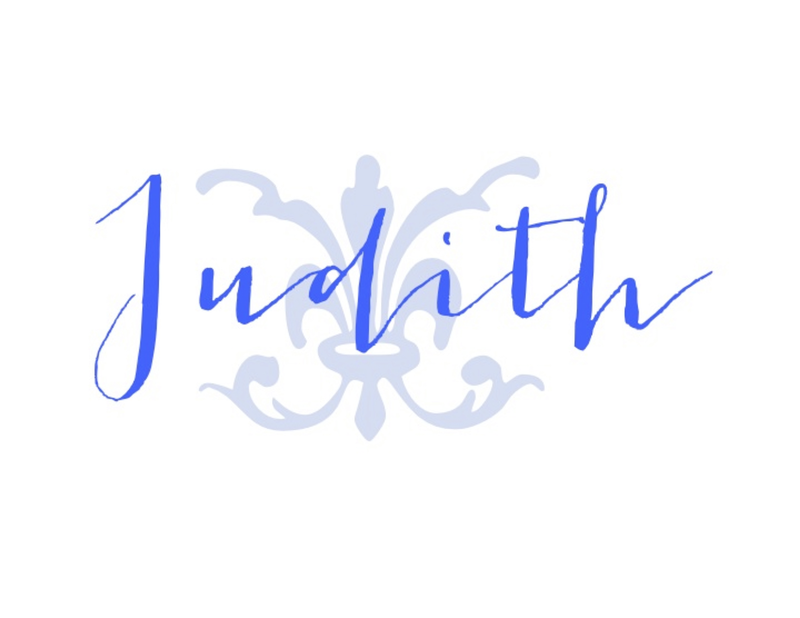 Cute porch, Judith. Thanks for linking to Keep in Touch.